With the 50th anniversary of the Grateful Dead and the special anniversary concerts coming up, a lot of people on the Internet are praising the band and compiling ideal setlists. I’ve decided to do the same, although this isn’t necessarily what I’d want to hear if I was going to one of the shows this summer. This is more of a dream compilation featuring songs from the many eras of the Grateful Dead. I don’t think it could ever be played how I picture it in my head. Alto & Tenor ≥ Baritone & Soprano, imho. I wrote up this post almost two months ago with the hopes of adding a few more examples. I haven’t gotten around to do that, so I’ll post it as-is. After the recent death of Bobby Keys, I spent some time thing about my favorite rock n roll sax solos. The sax solo is a time-honored tradition, and I’m sure there are many lists already compiled that would be a much more interesting read than anything I could come up with, but I did think about one aspect of the sax solo that probably doesn’t get nearly enough attention: the sax player shout out by the front man. So, here is a list of some of my favorite shout outs. This year marks the 20th anniversary of Bull Moose. I’m not sure of the actual date the first store in Brunswick opened, but since mentions of the anniversary have become more frequent, both at Bull Moose’s site and in the media, I figured the time was right for me to post some memories of my favorite music/movies/video games/etc. store. 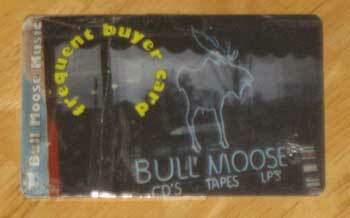 I’m pretty sure that my first visit to a Bull Moose was in the spring of 1998. Some friends and I left Waldoboro to drive into South Portland to do some shopping in the mall area. On our way through Brunswick someone decided we should stop to visit a record store I had never heard of before; the only music store in town I was familiar with was the chain store at Cook’s Corner. I remember walking in and being impressed with both the huge selection of music, but also with all of the other merchandise, as well as the cool music playing and interesting stickers and posters covering the walls and windows. This wasn’t slick or corporate, it was like visiting a cool friend’s basement rec room. I knew that in a few months, when I started attending Bowdoin, that I would be spending a lot of time at this quirky shop right down the road (it wasn’t until a few years later that I learned the founder of Bull Moose was a Bowdoin grad; I began to love the store even more). I don’t have the receipt of my purchases that day, but I do know one of the discs I walked out the door with was Old and In the Way’s self-titled release. I was getting into the Grateful Dead over the past year and had recently been introduced to Jerry Garcia’s diverse side projects. This bluegrass effort seemed like a promising album and eleven years later, I still consider it one of my favorites. Besides the CD I purchased, I do have one other memento from that day. I signed up for my frequent buyers card during that visit, and I still have the same card in my wallet. It’s been in my pocket longer than any other card I carry, and I’ve had to repair it with packing tape to keep it from breaking in half, but it is still the one card that I don’t leave home without. Walking down the stairs and into the Old Port location to find myself in the middle of a very low key El Vez live performance. Being called out by name when I accidentally left my frequent buyer card behind at the counter. Sure, maybe the only reason the girl working new my name was because she had just scanned my card, but I’d like to think it was because I was visiting the Brunswick store an average of two to four times a month. Buying a copy of Johnny Cash‘s Unearthed box set (in pristine condition) from the used section and being complimented for my good taste in music while also being chided for buying it before any of the staff had a chance to set it aside for themselves. As I implied above, in college I was a pretty big Phish fan. The band was playing two nights at the Cumberland County Civic Center in December of 1999 and I wanted tickets for both nights. I had quite the scare when I went to buy my tickets at Bull Moose. I don’t know if the cashier hit a wrong button, but when I first tried to get them, he told me the show had just sold out (the people in front of me in line all got tickets). Luckily for me, he tried again and was able to secure my tickets for the shows. All of these moments stand out enough in my mind for me to recount them here, but I think the small, insignificant experiences that blend together are the ones that I remember most fondly. I don’t know many times my friends and I have walked into a store and spent literally hours browsing, trying to decide which or the thousands of great discs we should spend out money on. At this point in my life, my collection is too large to remember where each CD came from, but I know a number originated as a discovery in the used section. Usually when I find a great disc for a pre-owned price I think about how lucky I am, but once in a while I feel sorry for the person who had to give up such great music. I can’t think of another store that makes something as mundane as shopping into such a wonderful experience for me. I’m really glad that Bull Moose is still with us (the full 20 years for some of you, 11 for me). We hear a lot about how the recording industry is changing and that it is impossible for independent music stores to survive. At this time of the year, when we think about all the things we are grateful for, I am very thankful that Bull Moose has proven to be successful in spite of what is occurring in the words of music and movies as well as in the face of such difficult economic times. I hope it is around for a long time to come. I can’t imagine buying my music, movies, or video games any place else. steely dan makes me weep. how many times can you watch zombies? it’s not a glow-stick, it’s a slim jim! what about the voice of geddy lee? In 1959 and 1960 Ornette Coleman was at the forefront of the free jazz movement. His albums for Atlantic Records during this period were as revolutionary as they were controversial. The name of the movement itself came from the title of one of his albums. After a few sessions in early 1961, Coleman would take a hiatus from recording, not releasing any new material until 1965, except for this partial document of his December 21, 1962 concert at New York City’s Town Hall. For this performance, Coleman used a new trio, not the group featured on his Atlantic recordings. David Izenzon playing the upright bass and the drummer Charles Moffett would also form the heart of Coleman’s group when he returned to the studio in 1965. 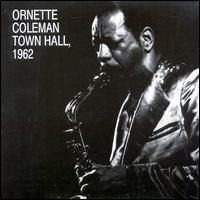 The album opens with two standard (for Ornette Coleman) songs. Of course, the Coleman standard was unlike anything else in jazz. Doughnut and Sadness (both Coleman compositions) clock in at nine and a half and four and a half minutes in length. Doughnuts features exceptional alto playing by Coleman and frantic yet stabilizing drumming by Moffett. Much of Coleman’s playing features fast honking phrases that he had become known for. The shorter piece, Sadness, finds Izenzon using a bow on his bass to play long, deep notes. Coleman also extends his playing, by using fewer notes but holding them for much longer. It provides the song with a haunting feeling perfectly captured in its title. The third cut, Dedication To Poets And Writers, is a Coleman composition, but the author does not play on it. In fact, Coleman commissioned a string quartet to perform his piece. Although sonically it is drastically different from the horn playing heard so far on the album, the piece has the undeniable feeling of Coleman. The music is both furious and piercing, yet extremely listenable. Interestingly, it features no improvisation, which is unlike Coleman’s other work. This album features the only available version of the song; Coleman never adapted the piece for a jazz combo. 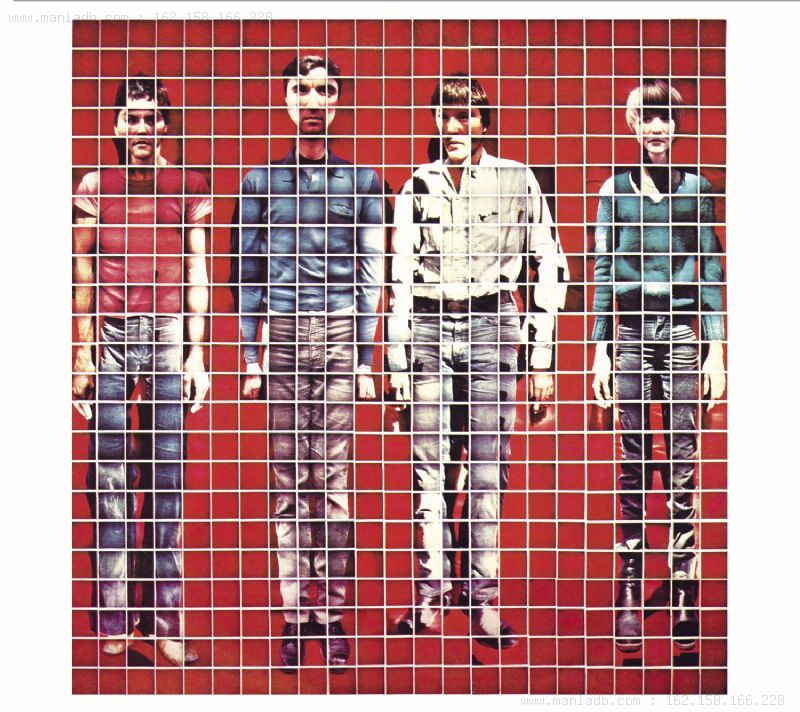 The album ends with a track that took up the entirety of side 2 of the original LP: The Ark. This is the cut that shows why Coleman was at the top of his game as he went into his self-imposed exile from recording. It begins with loud sax phrases and continuous cymbil work over calm bowed bass tones and continues on for neary 24 minutes. The rhythm section drops out occasionally to give Coleman room to improvise alone. Coleman returns the favor, allowing each of his sidemen solo passages. Near the end of the piece, Moffett gets a long section to himself to bring the piece to a wild close just a Coleman reappears to wrap things up, with the final notes coming from Izenzon vibrating bass. Its a remarkable performance containing the finest elements of Coleman’s advanced work for Atlantic, yet stripped down to the bare essentials with this new trio. Town Hall 1962 was originally released on ESP as ESP Disc 1006. It is available digitally through eMusic. Session information (including songs performed at the concert but not released on this disc) is availble through the Jazz Discography Project. One thing I’d like to with this blog this year is post a series of album reviews. I spend a lot of time listening to music, and enjoy talking about it. It’s about time I wrote some of this down and shared it with you. I’m not sure how often I’ll post album reviews, but I’d like to do at least one a week, if I can. The first review will be posted shortly. There were a few albums I decided not to purchase, like some Tom Rush, Kenny Loggins and live Genesis. I did not find any Randy Newman lp’s I didn’t alreadyown, which was disappointing, but I was very excited to find two David Bromberg albums I didn’t own. Overall, a sucessful record sale. On the bike ride home, I stopped in to Novare Res and had a few more bottles. I’m now at 184 out of 200 for the Uprising. There are two people (that I know of) ahead of me (in addition to the four who have already finished). I estimate that I’ll be done by Thanksgiving. I’m really excited! It has been a very elightening and rewarding journey thourgh all sorts of new beers. Also: good news regarding the Trappist event at Novare this Tuesday. Even if you can’t pony up the $60 to take part in the Trappist beer tasting that night, you can still go and enjoy a few fine bottles of beer. The tasting will be taking place in the side room (sorry fans of darts and leather couches); the main room will be open to the public. Perhaps I’ll see you there! for insight, information and theories. One of the more light-hearted fixes I take part in is the MySpace band “Previously On Lost,” who recap each aired episode with a funny song. Hypeful had entries on their site with links to the first two recap songs (1, 2), but have not yet posted number three and have removed the direct download links from the first two songs. All the songs are available on the band’s MySpace page though, either through streaming or through a storefront right on the MySpace page. Very convenient! Go support LOST obsessed independent artists and enjoy some fun music. Update: I’ve removed the information on getting the mp3 files per the band’s request and edited the post to reflect this. If I hadn’t, I think the band would have fed me to the smoke monster. I got to see the Fiery Furnaces last night at Space Gallery. What a great show! I’ve quickly (i.e. in 3 weeks or so) gone from knowing virtually nothing about this band to becoming a big fan. I still haven’t waded through the album they recorded with their grandmother, but all of their other discs I’ve really enjoyed. Highlights last night: an audience requested Tropical Ice-Land and a blazingly sped-up take on Asthma Attack. Following the rules set out on The Accordion Guy’s blog, construct a dada album cover. 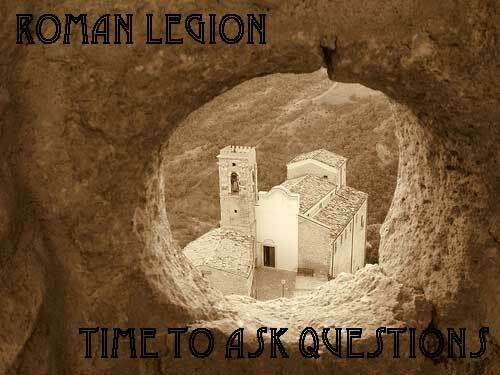 By using these three links, I have created “Time To Ask Questions” by Roman Legion! I listened to more new music this year than any previous year, thanks to all the music blogs listed in the sidebar. It’s through them that I discovered all sorts of new bands and great albums. What follows is a list of my favorite albums of the year (in alphabetical order). Heimdalsgate Like A Promethean Curse Of Montreal Hissing Fauna, Are You The Destroyer? Welfare Bread King Khan & His Shrines What Is?! There are a few albums I have yet to hear, which may end up added to my list of 2007 favorites (such as the I’m Not There soundtrack and releases from The Autumn Defense, Ween, Bruce Springsteen, and Son Volt), but as of year-end these are my favorites. What were some of your favorite songs/albums from the past year? What have I missed that I should check out?